3 yard mini skips are the best rubbish removal solution for jobs that need to get rid of small amounts of waste. 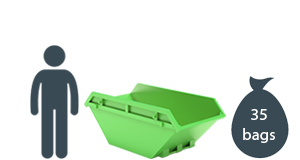 These skips are one of the smallest and cheapest skips available throughout the UK. They are the popular choice for disposing of household waste and garden waste. As one of the smallest available skips, 3 yard skips are also one of the cheapest skip rental services you can get. The regular price of 3 yard skips ranges from £75 to £120. The typical 3 yard skip has a dimension that measures 6 feet long x 4 feet wide x 3 feet high (1.82m x 1.22m x 0.91m). It can hold up to 35 black bin bags, making it the ideal size for getting rid of domestic and garden waste. 3 yard mini skip is the best choice for getting rid of most types of waste such as domestic waste, garden waste junk and more. But certain kinds of waste can’t be thrown into any skip. To give you an idea about the materials that can’t be thrown into any skip, refer to the list below. A 3 yard mini skip is a perfect choice disposing of small amounts of waste such as domestic and garden waste. With their compact size, they are ideal for small home improvement projects like kitchen and bathroom refits. They are also suitable for garden clearance as well as small DIY jobs. Permits are only needed if the hired skip is placed on a council land. If the skip is placed on a privately owned land, skip hire permits are not required. In most cases, 3 yard skips are small enough to fit in a property, so permits are no longer required. If this size does not meet your requirements you may wish to upgrade to the 4 yard skip.